In a scene the ancient Greeks could never have imagined, two Russian cosmonauts plan to carry an unlighted Olympic torch outside the International Space Station Saturday, staging a symbolic spacewalk relay as part of the build up to the 2014 Winter Games in Sochi, Russia. Soyuz TMA-10M commander Oleg Kotov and flight engineer Sergey Ryazanskiy plan to open the hatch of the Russian Pirs airlock compartment around 9:30 a.m. EST (GMT-5) Saturday. "We will take a picture of it with the space station in the background, with the Earth in the background," Kotov said in a NASA interview. "I think these will be very interesting videos and pictures that will be used to promote the Olympic Games." Said Ryazanskiy: "Unfortunately we cannot light it in space, so we will simply take it to space and take pictures and some video with the station and the Earth in the background. It will be a real Olympic torch. ... I think it will be the last torch that will be lit during the Sochi Olympics relay." To make the orbital photo op possible, Russian mission managers had to juggle the space station crew rotation schedule. Normally, only two three-seat Soyuz ferry craft are attached to the station at any one time, supporting a crew of six for overlapping six-month tours of duty. To get the torch up to the lab and then quickly back down to Earth, a Soyuz launch was moved up to get nine people on the station -- and three Soyuz spacecraft -- at the same time. Soyuz TMA-11M commander Mikhail Tyurin, Rick Mastracchio and Soichi Wakata arrived early Thursday, bringing the Olympic torch with them. Welcoming them aboard were Soyuz TMA-10M commander Kotov, Michael Hopkins and Ryazanskiy, launched Sept. 25, and Soyuz TMA-09M commander Yurchikhin, flight engineer Luca Parmitano and Karen Nyberg, who were launched May 28 and are closing out a long-duration stay in space. After the spacewalk Saturday by Kotov and Ryazanskiy, the torch will be handed off to Yurchikhin's crew for return to Earth Sunday night aboard the Soyuz TMA-09M spacecraft. After landing near Dzhezkazgan, Kazakhstan, expected around 9:49 p.m. EST, the torch will be handed back to Olympic organizers. The space relay began when Tyurin floated into the station Thursday. 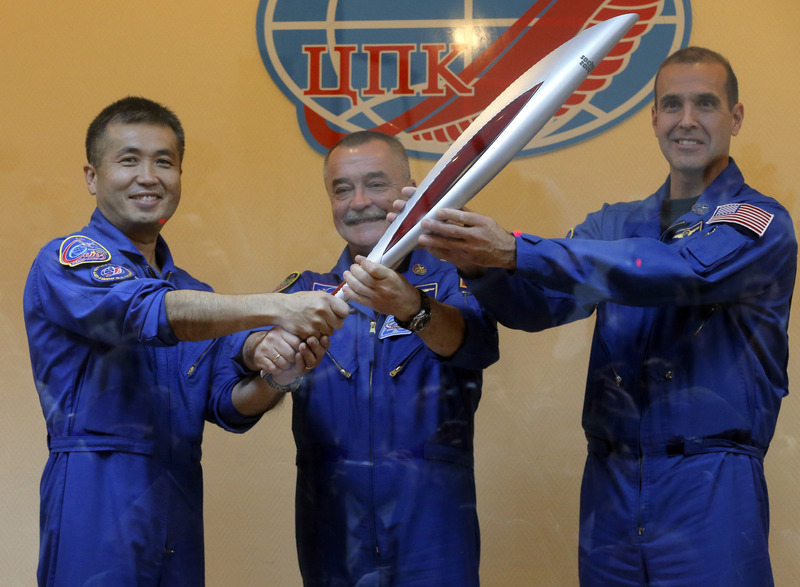 He promptly presented the torch to Yurchikhin, who told reporters today the entire crew took part in a symbolic torch relay inside the lab complex. Wakata carried the torch through Japan's Kibo laboratory module, handing it off to Parmitano, a European Space Agency astronaut, who carried it through ESA's Columbus module. Hopkins, Nyberg and Mastracchio then carried the torch through the U.S. segment of the station, handing it off to Tyurin, then Ryazanskiy, then Kotov and finally Yurchikhin, who "secured it in the Russian segment in a special place." Saturday's spacewalk will be the 174th since station assembly began in 1998, the eighth so far this year, the fourth for Kotov and the first for Ryazanskiy. Using the call sign EV-2, Ryazanskiy will float out of the airlock first, carrying a tethered holder for the torch and commercial Go-Pro cameras to record proprietary video of the torch for Olympic organizers in Russia. Tyurin will shoot video and take proprietary pictures from inside the multi-window cupola compartment. While that footage will not be seen in real time, NASA will broadcast live views from its own cameras throughout the spacewalk. Kotov, EV-1, will hold the torch in the open hatch of the Pirs module while Ryazanskiy takes pictures and mounts cameras on a spacewalk ladder to record the scene. Tyurin then will float outside, make his way to the ladder where he will meet up with his crewmate. Both cosmonauts then will pose for the cameras and Kotov will hand the torch off to Ryazanskiy. Both men then will turn to face a NASA camera, carry out another handoff and pose for more pictures and video. The torch then will be carried to yet one more location for an additional handoff and additional pictures before being returned to the airlock and safely stored away. "We are going to move along outside the Russian segment and we will be symbolically handing over the torch from one crew member to the other," Kotov told reporters Friday. "We will repeat that a couple or three times to make sure we will have a pretty picture to show the whole world. "Our country will see the torch in a nice way, with the background of the Earth and black space. ... So it is sort of a creative task. It is technically challenging and we hope for success." Kotov and Ryazanskiy then will turn their attention to the more routine aspects of the spacewalk, moving a foot restraint needed for an upcoming spacewalk and finishing up work on a camera mounting platform that will be used by a Canadian company, Urthecast, to stream high definition Earth views to subscribers around the world. The camera is scheduled for installation during a Dec. 23 spacewalk. A final task involves disconnecting a plasma wave experiment and securing it in place. If time is available, the cosmonauts will carry out an inspection of insulation on the hull of the station. Ryazanskiy said the orbital torch relay was the result of joint talks between Roscosmos, the Russian federal space agency, and the Olympic Committee. "The Olympic torch will be traveling all over Russia," he said. "They will also take it to the bottom of the deepest lake on Earth, Lake Baikal. Then it will be raised to the highest Elbrus mountain. So why the station? Why not?"